Let’s talk coconut. I find it’s one of those things that people either like or don’t like and there isn’t much middle ground. I fall into the like category. No, wait, I fall into the LOVE category. 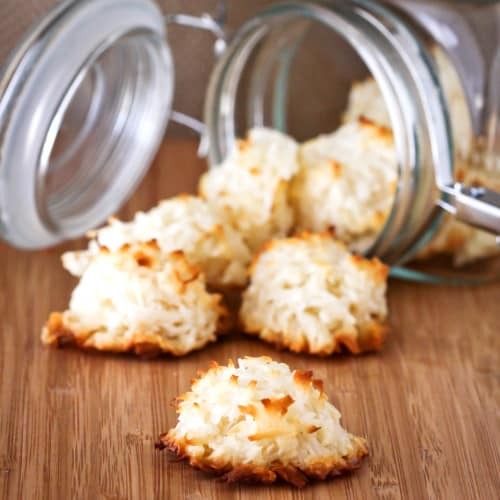 Lately I’ve been kind of coconut obsessed, so when McCormick asked if I would like to try making their Easy Coconut Macaroon recipe and share it with my readers and Pinterest followers (as well as a giveaway – keep reading! ), obviously I was on board. These are beyond easy and unbelievably delicious. It’s safe to say that between my husband, and myself these did not last long (I’m talking less than 24 hours…). 1. Preheat oven to 350°F. 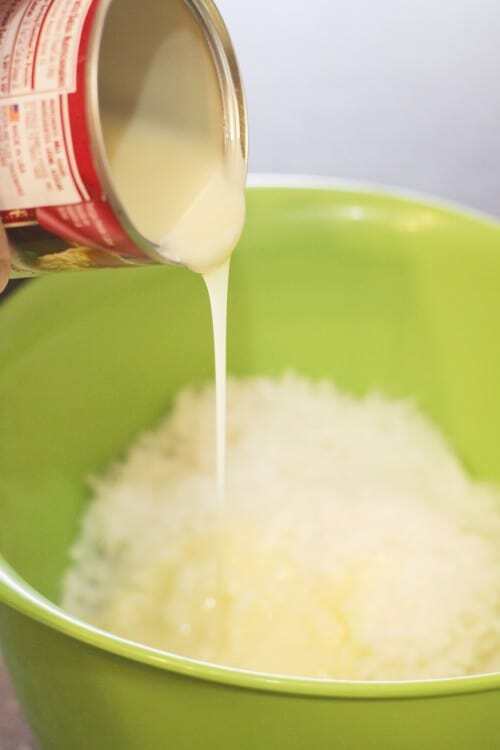 Mix coconut, sweetened condensed milk and almond extract in large bowl. Drop teaspoonfuls of mixture onto greased baking sheets. 2. Bake 10 to 12 minutes or until edges are lightly browned. Immediately remove from baking sheets to wire racks; cool completely. Three ingredients. Quick and easy. Incredibly delicious. If you are a coconut lover, this is a must make recipe! The kit includes: A spring apron, Corningware baking dish, spring cookie cutters, muffin/cupcake pan, whisk, MeriMeri spring cupcake liners, McCormick Assorted Food Color, McCormick Ground Cinnamon, Ground Ginger, Vanilla Extract and Lemon Extract. Would you like to win??? I know, silly question! There are a few ways you can enter to win. 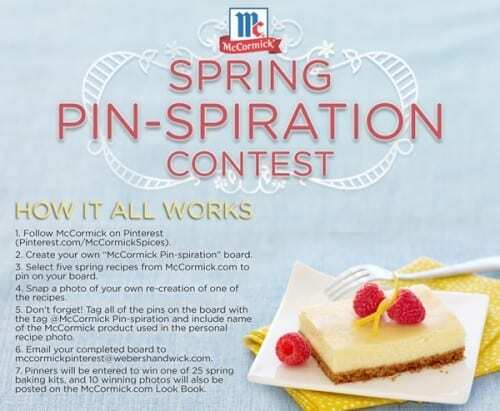 You can enter here at Love From The Oven and you can also enter to win one of 25 Spring Baking Kits directly from McCormick in their Spring Pin-Spiration Contest. 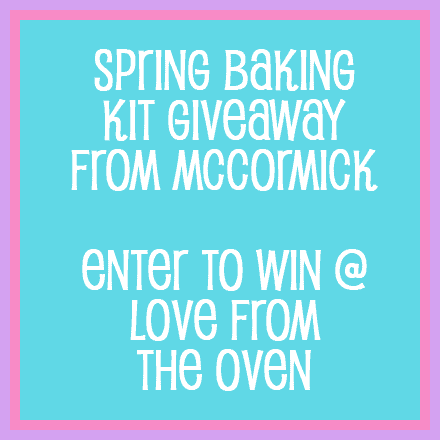 To enter here at Love From The Oven, leave a comment telling me what your favorite thing to bake for spring is. Please use Rafflecopter to make sure your entry is recorded. In addition, you can earn extra entries by following Love From The Oven and McCormick on Facebook, Twitter or Pinterest. You can also share this contest with your friends on your favorite social media sites for yet another chance to win! Good luck! Open to US Residents Only. favorite thing to bake for spring is strawberry cake! I think that those macaroons might be my new favorite thing to bake for spring. I’m going to have to go out this weekend to pick up the ingredients! I love making cheesecakes! I don’t even like eating them, but I like to make them. I think the challenge is what attracts me, and my mom will give me honest feedback on my cheesecakes so I like trying to get a perfect one! I want to win!!! Please! My favorite thing to bake for spring is Easter cookies. I’m not very good at decorating cookies yet, but the kids like to try and practice and the more frosting and sugars the better! They also like making lots of colors with the frosting in light spring colors! 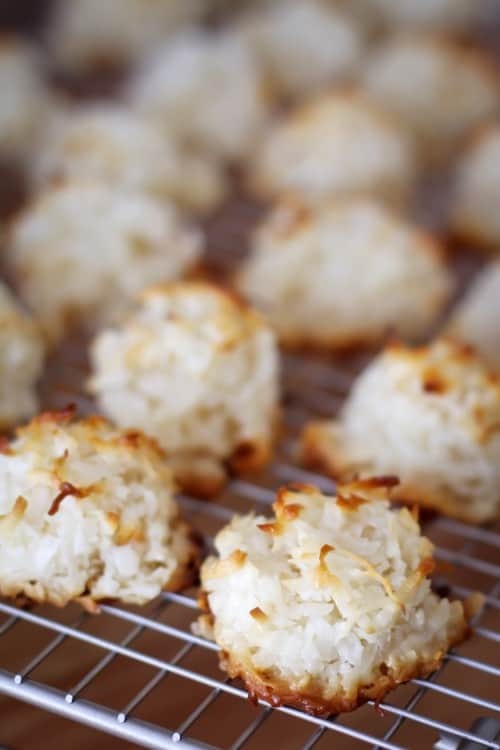 I love baking something that makes me think of warm weather, and these coconut macaroons sure fit the bill. Love to make light and airy cupcakes for spring… with real butter cream icing. maybe with a little raspberry! It seems like blueberry muffins fit the bill for spring time baking. Especially with a struesel topping. I made this delicious sugar cookie thingie with fruit on it last year, decorated to look like the USA Flag (strawberries and blueberries) Favorite thing I made last spring! 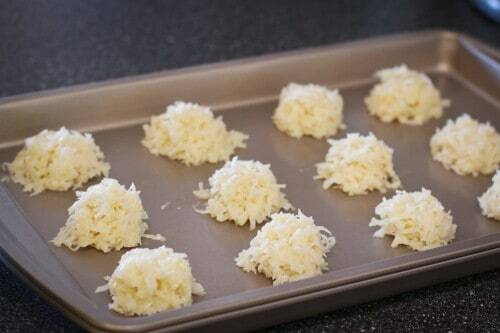 I never knew that macaroons could be soooooooooo easy to make. I can not wait to try this recipe . Cupcakes and cake pops in springy colors! And anything with coconut because it’s just a yummy, light springy flavor I think! I would love to bake some mini strawberry cupcakes!!! I love making strawberry cheesecake and when spring comes around its the perfect refreshing dessert! Dark chocolate cupcakes with green cream cheese frosting done like grass and candy decorations like little flowers. So much fun! Love baking and decorating Easter egg cutout sugar cookies! always looking for good dessert recipes that secretly take no time at all and no preparation. this is perfect! My favorite thing to bake will always be cupcakes!! But I am definitely trying these macaroons!!! These look delicious and easy! I love baking my famous cheesecake. My favorite thing to ake in the springtime is coconut cake, and its my favorite thing to eat also. I have been wanting to try my hand at homemade cadbury eggs! Angel Food Cake with whipped cream for frosting is my favorite. It’s light, fluffy, and so yummy! favorite thing to bake for Spring are cupcakes made to look like little Easter baskets! I like to make lemon meringue pie. I love making Easter-themed goodies, especially ones that involve coconut! I love to bake carrot cake cupcakes for spring! I love to bake different flavor cupcakes using the fresh fruit that is in season at the time. YUMMO!! Chocolate swirl cheesecake topped with fresh strawberries…yummm…. Anything lemon is perfect for spring baking. Especially lemon bars. Yum! My favorite thing to bake in spring is my famous Easter cheesecake. My favorite thing to bake in spring is a Fruit Triffle! i love to bake cupcakes. something about spring makes me think cupcakes. and trifles. those go hand in hand with spring. fresh fruit always gets added to mine as well. I Iove making spring time cupcakes and cake pops!!! I would love to win this Baking Kit. My favorite thing to make in spring is cupcakes!! But more fruity-ish kinds of cupcakes such as strawberry shortcake, peach, margarita, etc! I love to bake fruit inspired desserts in spring! I love to make Paula Deen’s Lemon Blossoms, LOVE LOVE LOVE THEM!!! These look easy and yummy, going to make them tomorrow, thanks for sharing. i’ve never attempted macaroons, but these looks incredible! only 3 ingredients?! sign me up! I love baking rock buns for easter as they are easy and fun to make and are always gone in a blink of an eye! Carrot Cake!!!! Or Lemon Pound Cake….and ALWAYS cookies! My favorite thing to bake for spring is carrot cake for my husband’s birthday. Spring for me means cheesecake! I love baking pies with in-season fruit! Love to make lemon meringue pie in the spring! My favorite thing to bake is layer cakes. In the spring I love to make lemon coconut layer cake with fluffy marshmallow frosting. Thanks! My favorite thing to bake in spring is fresh raspberry quick bread. Great for breakfast. Lots of coffee cakes with berries. I like to make quick breads and sugar cookies. I also like to make macaroons in the spring. Sometimes I color them green like grass and put chocolate eggs in like little nests! I love to make Carrot Cake in the Springtime! Lemon Bars! they just scream spring to me. I love baking cookies year round! I am thinking of doing a mini dessert table for a spring get together soon! I think my favorite thing to make for spring is Strawberry Cake!! I love strawberries and that pink color that they give to cake, cupcakes, etc… is just awesome !! Anything involving strawberries – shortcake, tarts, etc. I love to bake anything with lemons …. From a simple lemon pound cake to delicious lemon squares or lemon tarts …. I think lemons are as refreshing as the spring it’s self ….!! Victoria sponge cake with raspberry jam & whipped cream filling, where the sponge is flavoured with almond extract. I love to bake Lemon Tea Cake in the spring (or anytime!). Thanks for the chance to win! I just love to bake LOL soooo picking something for Spring is not easy…there are so many wonderful things! I enjoy baking cookies & cuppie cakes mostly! I make the cutest cupcakes with dyed coconut ”grass”, Airhead eggshells, and Peeps! In the spring I make angelfood cake or pound cake and serve it with fresh strawberries and whipped cream. you know, the bunny cake w/ 2 round cake pans. but now the kiddies are older, i think these macaroons. My favorite thing to make in the spring/summer probably is lemonade dessert. Thanks for the contest! I love making lemon flavored anything in the Spring. Scones, muffins, cakes, cookies etc. strawberry shortcake is my favorite cake to bake for the spring. Now that I’m in the US again (from Japan), anything with raspberries! I like to make tortes in the spring! I love to bake banana bread. My favorite thing for Spring was my grandmother’s raisin bread with icing. We love baking specialty breads and anything topped w/fresh fruit like strawberry or mixed berry shortcake. My go-to spring recipe is always Banana Cream Pie bars. So easy, yet so rich and delicious. I like making strawberry cheesecake. Yum!! I love baking with fresh fruit! I love macaroons, can’t wait to try this. I always bake carrot cupcakes in the spring and my grandma’s zucchini bread. I have wanted to make strawberry shortcake! I love to make everything all year round 🙂 I eat pumpkin pie in the summer and watermelon ceviche in the winter. I love experimenting with cupcakes…. I love baking key lime pie! I love making mini chocolate chip muffins and using pretty cupcake liners! Love to bake cookies and cupcakes for my family. I love to bake lemon bars & cookies ! I love making fudge bars! They’re soooo yummy. I love baking fresh fruit muffins – blueberry, strawberry, lemon! Bright, fresh flavors. I followed this site on facebook. I followed mccormick on facebook. I love to bake anything with fruit…pie, muffins, bars…yum! My favorite thing to bake in spring is Easter cupcakes! I enjoy baking them and getting together with my nephews and letting them help me decorate all the different colored cupcakes. Watching them eat what they decorated is the best reward! Oatmeal bars with homemade jam. I love fruity stuff for Spring – like fruit tart or strawberry rhubarb pie! Mmm, I love macaroons, these look so easy! What a great giveaway as well! I love to bake a coconut layer cake for my Dad since it’s his favorite. Love baking good ole sugar cookies! In the spring, I love baking cupcakes & making cake balls!!! Anything with lemon…lemon just SINGS spring to me! For the spring, I like making chocolate covered strawberries. Mmmmmm. My favorite thing to bake during Spring is Easter cookies and anything with strawberries or lemon flavors 🙂 Would love to win this. Love the apron!! Pineapple upside down cake in the crock pot. Doesn’t heat up the whole house here in Arizona. I also love aprons. My favourite thing to bake for spring is bakewell cheesecake! Spring to me means fruit. It’s the time for lemon bars, blueberry cheesecake, and apple pie to me. my fav thing to bake in spring is basically anything with fresh strawberries. Strawberry muffins, strawberry crisp, yum! Strawberry Shortcake or blueberry pie! It isn’t really baking, but I love making a sweet and spicy fresh fruit salad. As far as baking, definitely peach pie! I love to bake cupcakes!!!! I’m planning on baking a carrot cake for springtime. All those beautiful spices and veggies. mmm! 😀 Thank you for the giveaway! I love to make pastel cake pops! And butterfly cupcakes! I like to make things with berries! My favorite springtime baking item is cupcakes, especially for Easter and adding pastel colors to the batter and/or icing. FUN!!!! Spring I love baking strawberry shortcakes! I love to bake muffins with fresh Spring fruit. Coconut creanm and Banana cream pies scream SPRING to me! 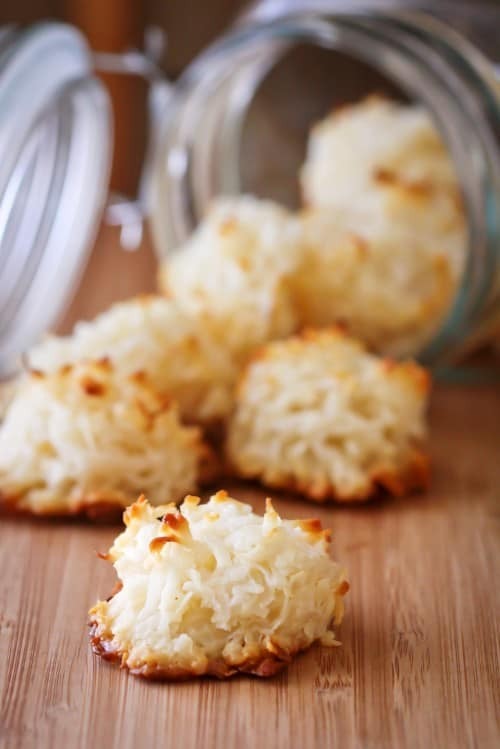 anything with coconut is my favorite so I can’t wait to try this recipe for macaroons! I love baking pineapple coconut cupcakes. They taste like springtime and happiness! I love baking cheesecakes in the spring and plan to make one today for Easter. i love to bake with anything lemon!! lemon bars in particular!! 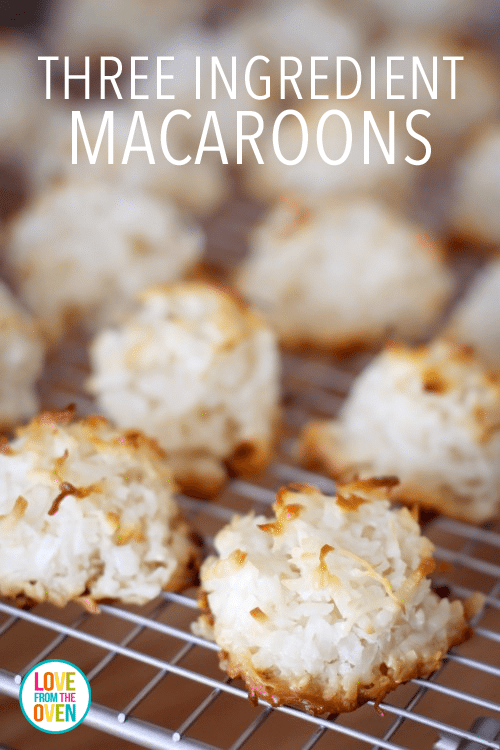 I love those coconut macaroons – so yummy, so easy! thanks for giving away such a nice prize! oops I didn’t realize I was supposed to comment on what I liked to bake in spring. I have a blackberry muffin that is so yummy – I have to wait for blackberry’s to come into season! Also strawberry cupcakes! Anything lemon, but especially lemon squares! I just LOVE to bake period. I bake for my two boys ages 17 and almost 15. Their favorite is cupcakes!! Coconut Cream Pie or anything lemon! I love baking anything with lemons and strawberries. I love to make anything with lemon….so refreshing at this time of the year! Love to bake my waistline just doesn’t like it to much. My favorite thing it bake all year around is pound cake. In the spring I make a trifle, normally with whatever fruit is available! Lemon Ricotta Cookies are my favorite to make when the lemons are fresh! Just made the most divine Rhubarb Custard Pie. A new favorite! I really want to make these macaroons for Easter! Spring! I love springtime and love to bake lemon bars and lemon poppy seed bread! Things with fresh citrus flavors. Thanks for the chance to win!! For Spring I love to make anything lemon or strawberry…just makes everything feel like springtime to me! I love baking spring and Easter themed sugar and shortbread cookies. 🙂 I love taking photos of them more than I do eating them, lol. I love baking cookies in various spring shapes!! I love baking key lime pie/cheesecake in the spring! Strawberry Shortcake, my husband loves it with fresh grown strawberries. I love to bake lemon muffins! I love to make knockoff Starbucks lemon loaf in the spring! Love to make all types of cupcakes and breads and than freeze them. So there ready to eat during the warm summer months without heating my kitchen. My favorite thing to bake for spring is lemon bars! I stumbled upon your blog, and it looks so fun! What do I not love to bake? My favorite is probably cookies! I love to make carrot cake in the spring!! I love making strawberry freezer jam every spring. My favorite thing to bake in the Spring? Hm that’s a toughie! Coconut filled eggs are always fun to make around this time of you! Banana Bread is always great as well! I love to make rice krispy treats which I do add McCormick vanilla to! I actually have two favorite things to bake for Spring. One are decorated Rice Krispy Treats and the other are decorated Spring sugar cookies!!! I have great memories of making them with my Granny!!! I love to bake anything lemon for spring. Lemon bars, lemon cheesecake, lemon poundcake – it’s all perfect for the weather! i love baking anything with strawberries and macarons! I’m all about lemon bars and testing out fun and fruity cocktails. lemon bars. They are such a fun, yummy treat! I like to bake anything with strawberries: strawberry shortcake (with real shortcake, yum!) or strawberry scones! I love to making Berry Trifles in the Spring. So refreshing! I love baking any kind of trifle with fruit in it. So light and fresh for spring! My favorite thing to bake for Spring is cupcakes. Easter and Spring is nothing without a Pastiera !! My favorite thing to bake in the spring is shortcakes. ANYTHING lemon!! Lemon bars, lemonade cupcakes, lemon meringue cupcakes, and key lime pie for my daughter. My favorite thing to bake in spring is carrot cake cupcakes! One of my favorite things to bake is lemon pound cake for Spring! I like to make easy spring cupcakes with butterfly gummies in pastel colors. I love baking with lemon in the spring! i love making anything w/ coconut! these look delish! OMgoodness. 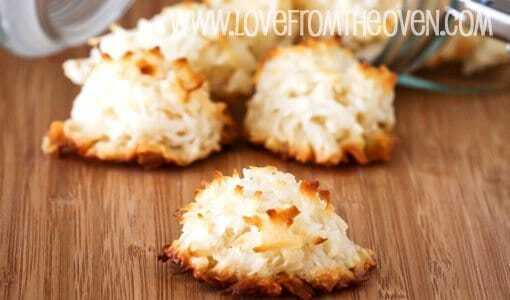 I am currently baking off my second sheet of these macaroons and they are so simple! my mother is a die hard macaroon fan but she’s also a picky one so I only buy them when I know they’ll be lightly toasted and sticky. These are perfect! As far as my favorite thing to bake in the spring? I love baking anything at all times but spring is actually when I tend to break out the Ice Box Cake (graham crackers layered with pudding and cool whip) or simple cookie reciepes. Ice Box Cake is a classic no bake thats perfect on a spring day and I love baking off cookies because you dont have to sit in a hot oven too long before you have lovely little treats. Some of my favorite cookies are lemon pudding cookies, chocolate chip, or white chocolate macadamia. I can not get enough of Chocolate Chip Cookies.